Mobile Solution Vendor사는 이동통신 솔루션은 국제 규격 준수를 통한 상호 호환성 확보 및 국제 로밍/연결성이 필수이며, 이를 위한 제품 개발시 3GPP, 3GPP2, IETF, OMA의 Spec을 참조하여 제품을 만들게 된다. 일반인의 입장에서 본 Spec을 보고 이해하는 것은 어렵지만, 규격의 전체적인 구성을 파악하면 이동통신 서비스의 필요한 구성 및 흐름을 이해할 수 있을 것 같아 공유한다. 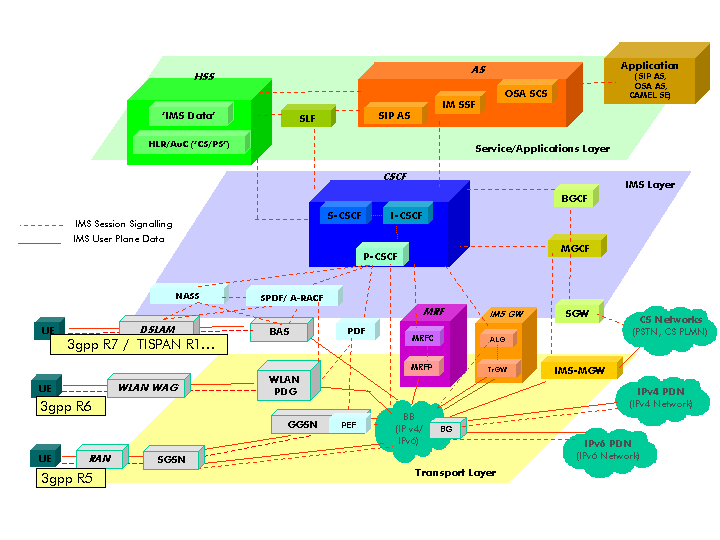 3GPP는 ETSI(유럽), ARIB/TTC(일본), CCSA(중국), ATIS(북미), TTA(한국)의 표준화 협의체를 주축으로 1998년 설립되었다. 3rd Generation Partnership Project의 약어임. 3GPP2는 IS-95/CDMA2000 (CDMA)기반의 표준화 협의체임. 버전별 큰 구성 흐름은 다음과 같음. 현재 우리나라에서 적용하는 버전은 Rel.5 기반이며, 이통사 R&D에서는 Rel.6이상을 준비하고 있다. Rev. 7까지 이동통신 망 구성도는 아래와 같다. W3C와 ISO/IEC와 상호간의 인터넷 표준 수립을 하고 있는 단체 Internet Engineering Task Force의 약어. Applications Area , General Area, Internet Area, Operations and Management Area, Real-time Applications and Infrastructure Area, Routing Area, Security Area, Transport Area 분야에서 해당 분야의 표준을 만들고 있음. 2002년도에 WAP Forum, SyncML 컨소시엄, Location Ieteroperability Forum, Mobile Games Interoperability Forum, Mobile Wireless Internet Forum이 통한된 Mobile 산업의 응용 서비스 표준화 및 상호호환성을 위한 단체임. 3GPP, 3GPP2, IETF, W3C와 Liason을 맺고 있으며, Mobile 응용 Application의 Bibile 역할을 하고 있다. Open Mobile Alliance의 약어. Requirement(DPE, Look and Feel), Architecture(OSE, PEEM, ParlayinOSE), Security(Security Common Function), Push to talk over cellular, Messaging(Mobile eMail, CPM, MMS), Presence & Availability, Device Management(DM,CP,FUMO,SCOMO,SMWSI,..), Data Sync, Location, Mobile Web Service, Browser & Content(DRM, DCD, BCAST), Mobile Commerce & Charging의 Work Group으로 구성된다. 각 표준화 기관의 연관성에 대한 도표는 아래와 같다.